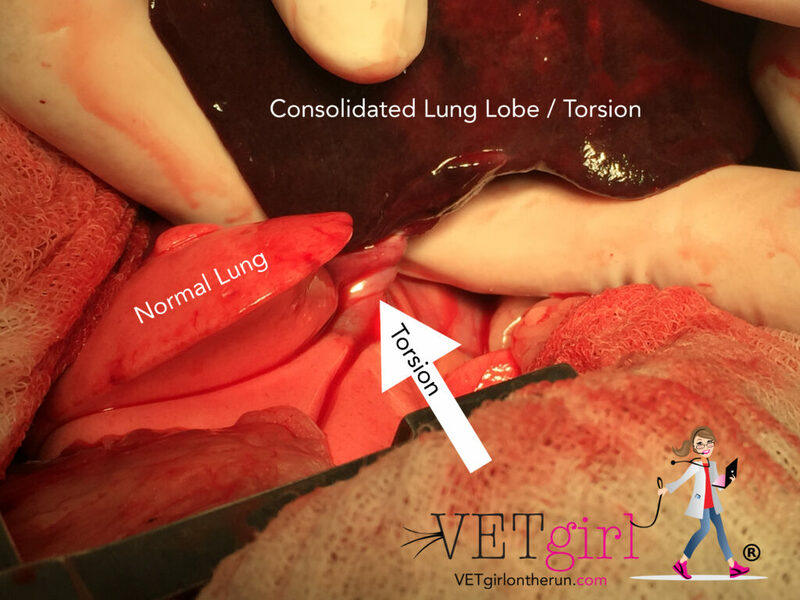 In today's VETgirl online veterinary continuing education blog, we discuss lung lobe torsions in dogs. Lung lobe torsions, although not very common, are often seen in the emergency room as the patient presents with an acute onset of respiratory distress. Although there are conditions known to predispose a patient to a lung lobe torsion (e.g. trauma, diaphragmatic hernia, pleural effusion, neoplasia, previous thoracic surgery, etc), many of these cases have an unknown cause for the torsion. While the pathogenesis of a spontaneous lung lobe torsion is not completely understood, one theory is that a partial collapse of a lung lobe will result in increased lung mobility, allowing the lung to rotate on its long axis. The rotation along the long axis results in a torsion of the bronchus and pulmonary vasculature. Similar to torsions of other vascular organs, the forceful and muscular pulmonary artery will continue to pump blood into the organ despite the torsion. While there is continued arterial bloodflow, the weaker pulmonary vein will not allow venous return and drainage from the organ (lung). This results in congestion of the lung lobe. 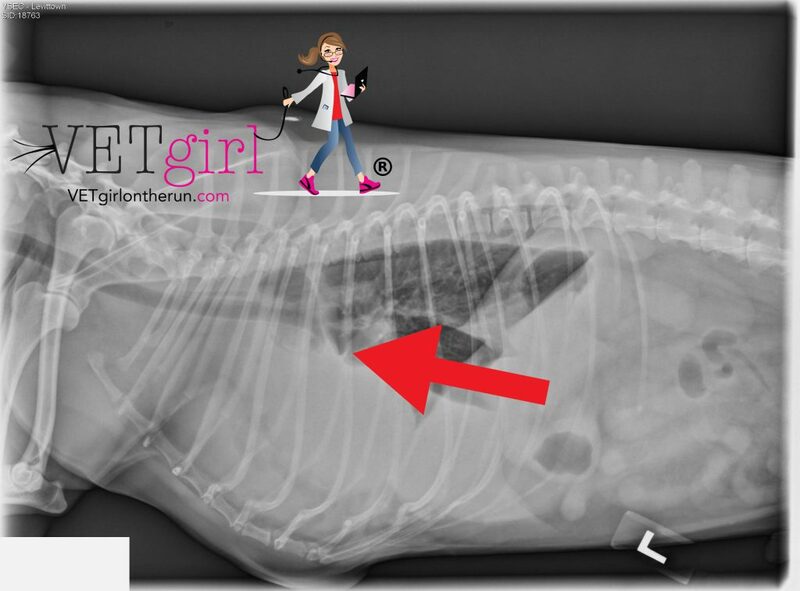 - Lung lobe torsion is more common in large breed, deep-chested dogs including Afghan hounds. - Although more common in large breed dogs, smaller breeds including pugs, Maltese, Yorkshire terrier, Pomeranian, Shih Tzu, and Pekingese have also been documented. Although advanced diagnostics including thoracic ultrasonography, computed tomography (CT), and bronchoscopy can be used to diagnose this condition, most practices do not have these diagnostics for immediate use or evaluation. - The right middle lung and left cranial lobes are most commonly affected in dogs. 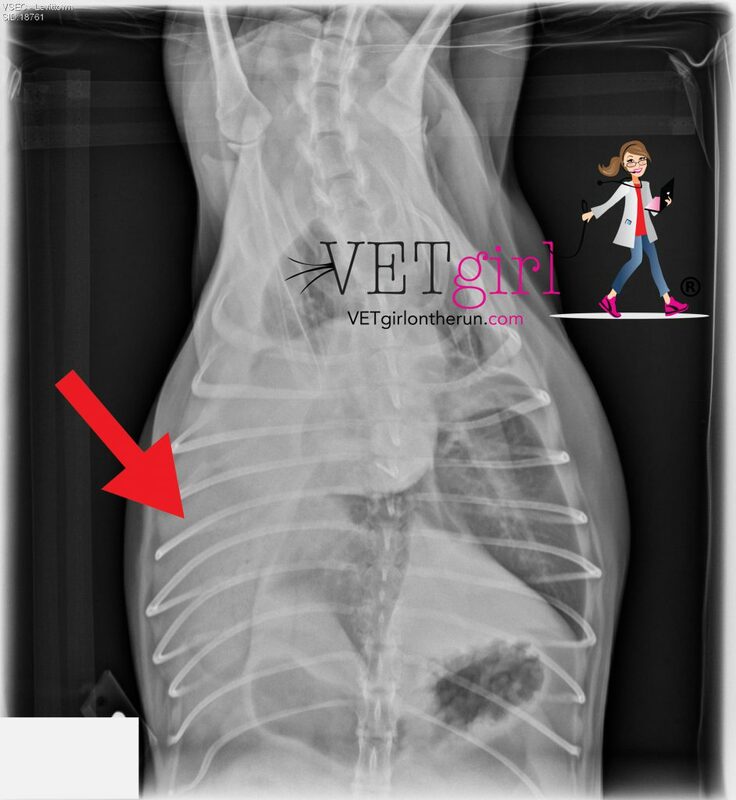 In this V/D thoracic radiograph, you can see the classic vesicular gas pattern in an otherwise area of consolidated lung. NOTE: Please make sure to get a 3-view chest radiograph series to help you! 2) Pulse Oximetry: Although this will not give a specific diagnosis, this is helpful to objectively document hypoxemia. Remember, a pulse ox reading of 90% is terrible, and correlates with a paO2 of 60 mm Hg (very hypoxemic, with 80-100 mm Hg being normal). 3) Thoracocentesis: As many of these patients develop pleural effusion, thoracocentesis for a diagnostic or therapeutic sample can be helpful. Cytology of pleural effusion is more likely to rule out other disease (e.g., neoplasia) than rule-in a lung lobe torsion. Pleural effusion in cases of lung lobe torsions are often serosanguineous to hemorrhagic with a classification of being a modified transudate. 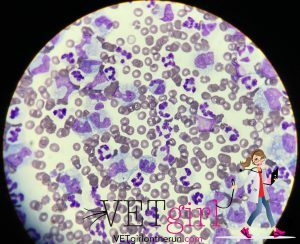 While there may be a neutrophilic, inflammatory component, infectious agents should not be seen. 4) Treatment: While patients with lung lobe torsion may require medical therapy including fluid therapy, oxygen therapy, and potentially sedation or analgesia, the definitive therapy is surgical removal of the lung lobe in question. 1) Cohn LA: Pulmonary Parenchymal Disease. Textbook of Veterinary Internal Medicine, 7 ed. Saunders Elsevier, St. Louis 2010 pp. 1118-19. 2) d’Anjou M-A, Tidwell AS, Hecht S: Radiographic diagnosis of lung lobe torsion. Vet Radiol Ultrasound 2005 Vol 46 (6) pp. 478-84. 3) Rooney MB, Lanz O, Monnet E: Spontaneous lung lobe torsion in two pugs. J Am Anim Hosp 2001 Vol 37 (2) pp. 128-30. 4) Santa DD, Marchetti V, Lang J et al: What is your diagnosis? Torsion of the right middle lung lobe. J Am Vet Med Assoc 2006 Vol 229 (11) pp. 1725-6.